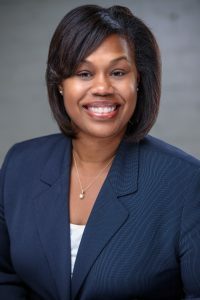 (Madison, Mississippi)—Felichia Fields, assistant executive director at St. Catherine’s Village, has been recognized as a top leader in the field of long-term care and senior care. Fields was named a Rising Star in the nationwide 2019 McKnight’s Women of Distinction Awards. The Women of Distinction Awards are overseen by independent trade publications McKnight’s Long-Term Care News and McKnight’s Senior Living, which received hundreds of nominations in this, the program’s inaugural year. An independent panel of judges comprising industry professionals and McKnight’s editors selected the winners, who were announced in March. This is McKnight’s first year for the Women of Distinction Awards, for which PointClickCare is the exclusive platinum sponsor. The program identifies women under 40 or with less than 15 years of experience in the field as Rising Stars. Nationwide, 21 recipients were named. Collectively, McKnight’s Women of Distinction have helped their organizations achieve major patient care and financial performance milestones. Winners include direct care providers as well as association and academic professionals. They have served as mentors or inspiration to their colleagues and in many cases pushed through personal hardship as well. Fields, a high-performing, long-term care operations professional with years of multisite experience, has served as the assistant executive director at St. Catherine’s Village since 2014. Previously, she was the assistant vice president of operations for the LaSalle Group/Constant Care Family Management in Irving, Texas. Fields also has spent a number of years in the non-profit sector working for Prevent Blindness and acting as the multicultural outreach coordinator for the North Central Texas Chapter of the Alzheimer’s Association, both located in Fort Worth. She is a licensed nursing home administrator. A native of Clarksdale, Mississippi, Fields graduated from Alcorn State University in Lorman, Mississippi with a bachelor of science in biology. She received a master of public health with an emphasis in health management and policy along with a doctor of public health (ABD) from the University of North Texas Health Science Center in Fort Worth. Fields also is a 2018 graduate of Leadership Madison County and was selected as one of the Top 10 Under 40 for Next Generation Madison sponsored by Madison the City Chamber of Commerce. In addition to Fields being named a 2019 Rising Star by McKnight’s, St. Catherine’s Village has received numerous awards itself. Last year, the community was named Best Assisted Living Facility and Best Retirement Community in Mississippi in the Best of 2018 Awards sponsored by the Clarion Ledger—recognition it received in 2017, 2016 and 2015, as well. In addition, Keep Mississippi Beautiful acknowledged the St. Catherine’s Village “Green Team” for its exemplary efforts in keeping Mississippi beautiful two years in a row. Furthermore, the all-inclusive Life Plan Community was the first in the state to earn accreditation by CARF-CCAC. This “commitment to excellence” seal signifies that the campus exceeds the standards established by the only international accrediting body for CCRCs. Campbell Cove and the Hughes Center are both licensed by the State of Mississippi as “Alzheimer’s Assisted Living” facilities. Located on 160 acres in Madison, St. Catherine’s Village offers independent living in apartments and garden homes, assisted living in Marian Hall, memory care in Campbell Cove, skilled nursing in Siena Center, and skilled nursing dedicated to memory care in Hughes Center. The private, gated community boasts wooded grounds, protected and beautiful outdoor spaces, a caring staff, on-site resident-centered care, and a mission-focused environment. Adults 62 and older are welcome at St. Catherine’s Village, where they are encouraged to enjoy fullness of life, health and faith. As Madison’s preeminent all-inclusive Life Plan Community, St. Catherine’s Village provides the right care at the right time for those in their retirement years. To learn more about St. Catherine’s Village, log onto www.StCatherinesVillage.com or call (601) 856-0123 to schedule a tour. Follow St. Catherine’s Village on Facebook at https://www.facebook.com/StCatherinesVillage/. All 2019 McKnight’s Women of Distinction winners will be honored May 16 in Chicago. Profiles of each will be featured both online and in print editions of McKnight’s Long-Term Care News and McKnight’s Senior Living. Visit mcknights.com and mcknightsseniorliving.com for more information. On Twitter, follow with #womenofdistinction.